Concreting (Drives, Yards and Shed Floors), Digger Work, Patios, Decking and Ponds. 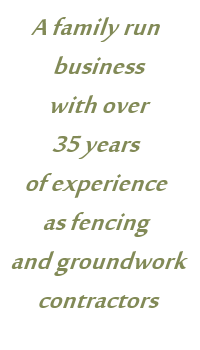 Horse Netting, Electric Fencing and Sand Schools. Holding Pens, Hedge laying, Stock Proof Fencing, Race Ways, Electric Fencing, Cattle Grids, Deer Fencing and Stiles.